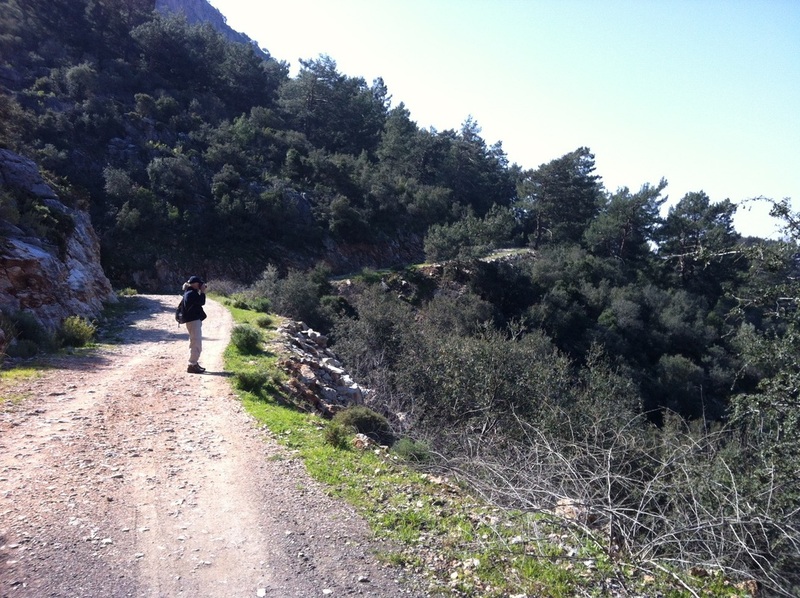 This may have been our prettiest day for hiking. 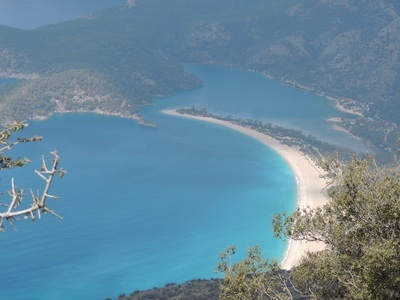 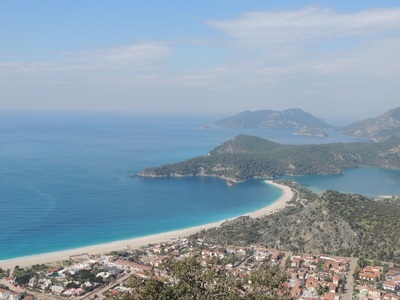 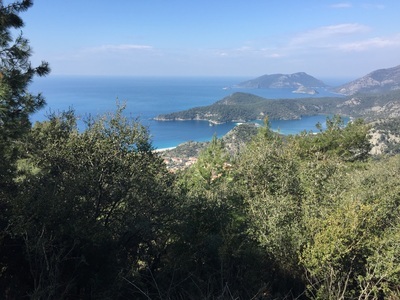 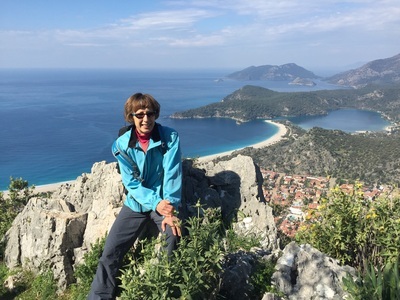 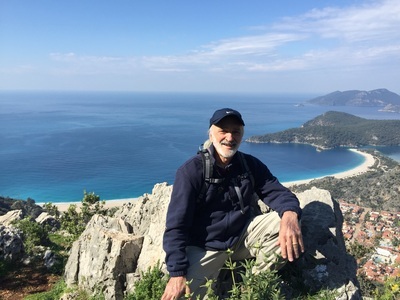 The Lycian trail begins at 300 meters and we quickly began a zigzag uphill climb with stunning views of the Ölüdeniz lagoon out to the Mediterranean. We saw some paragliders landing on the beach after gliding down from Baba Dagi - a mountain that we passed later in the day. At 950 meters we reached the top of this bit of trail to find some unfinished villas and a small village. 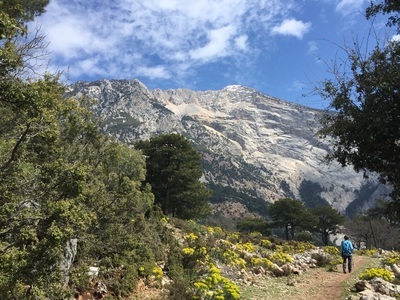 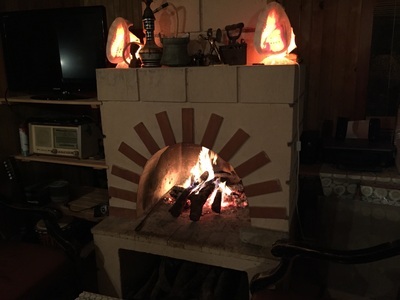 We filled our water bottles from the cistern which has natural spring water flowing down from the mountain - seems so strange to be able to drink the natural water - I guess we're too accustomed to 'civilisation' and bottled water. 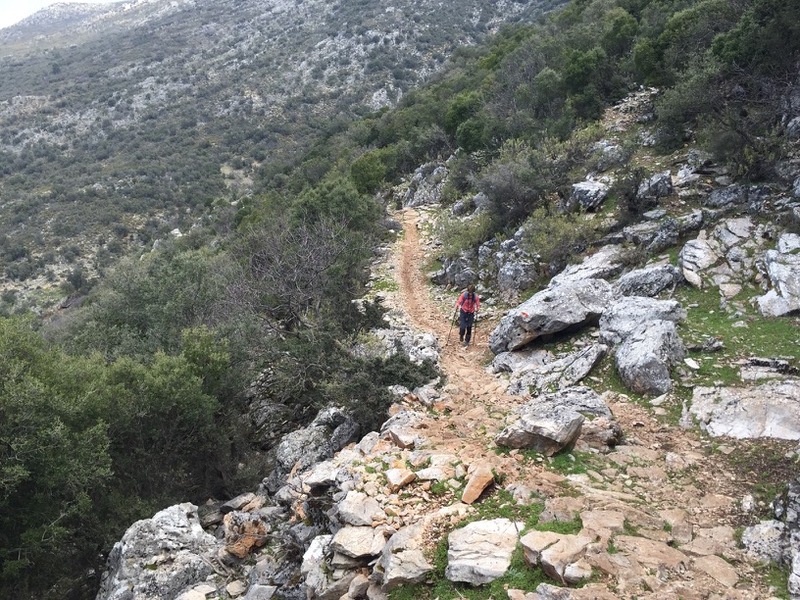 Here we met 2 German girls hiking with full packs for camping - we talked for awhile and walked together for a bit - we met them on and off for the next 3 days as we overlapped each other along the trail. 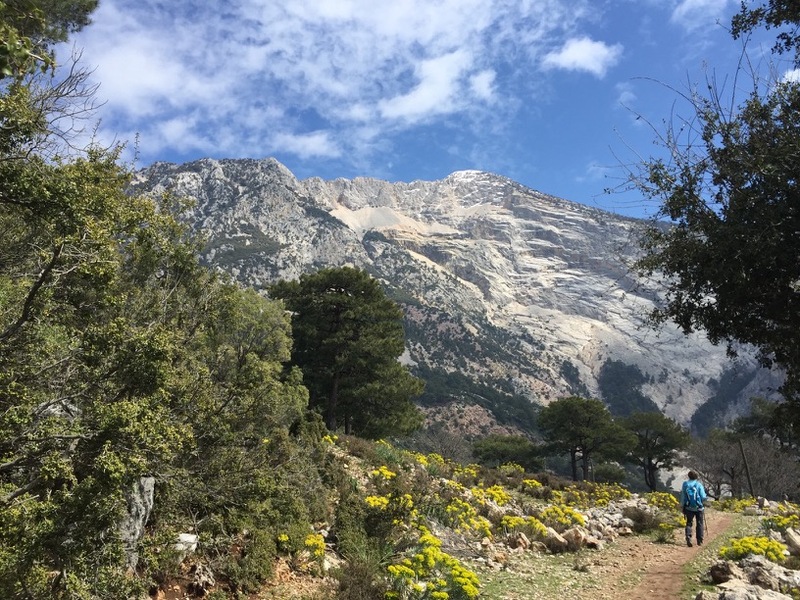 We walked along the shoulder of the impressive snow capped Baba Dagi (Father Mountain) and found out later from others that the other side of the mountain still had 2 meters of snow down the slope. 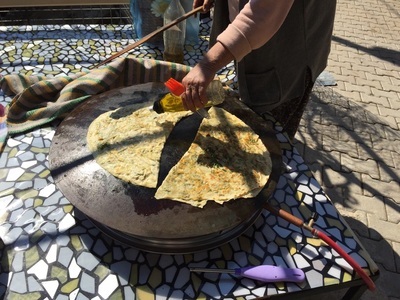 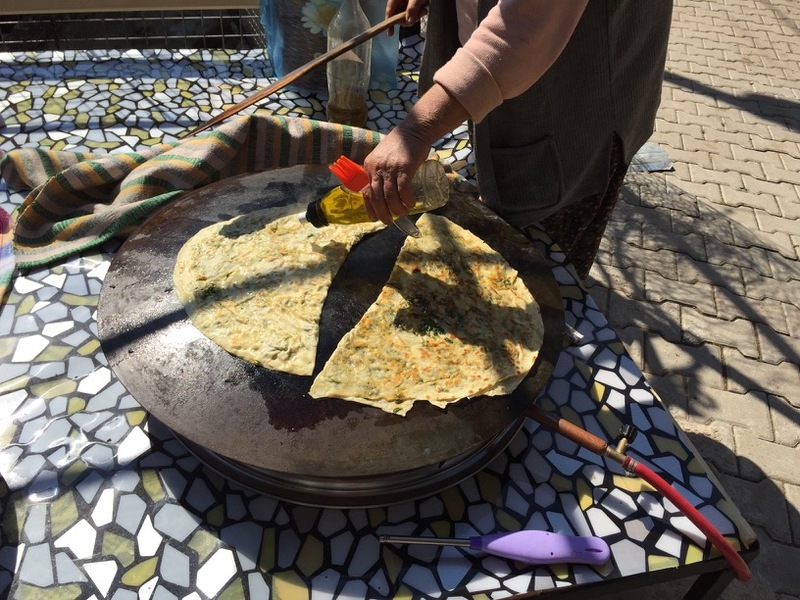 Along the way, we passed through a small village where some women were selling Turkish pancakes - Gözleme - along the side of the path, so we stopped, ordered one, and watched them prepare it. 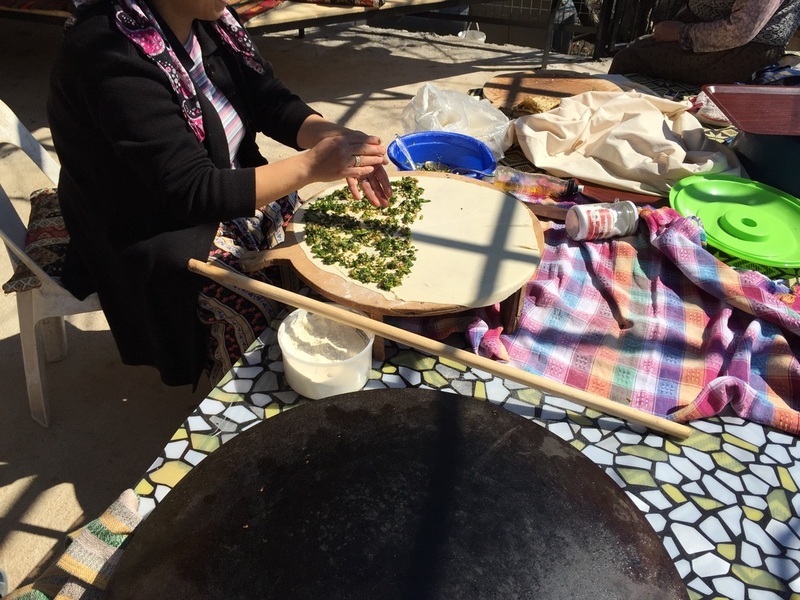 The dough is already made, one lady rolled it out paper thin, then filled it with a blend of green herbs and veggies and folded it in half. 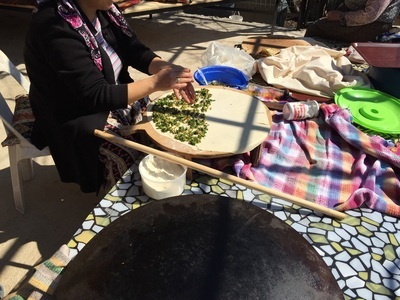 Another lady oiled it and placed it on a rounded dome oven for cooking. 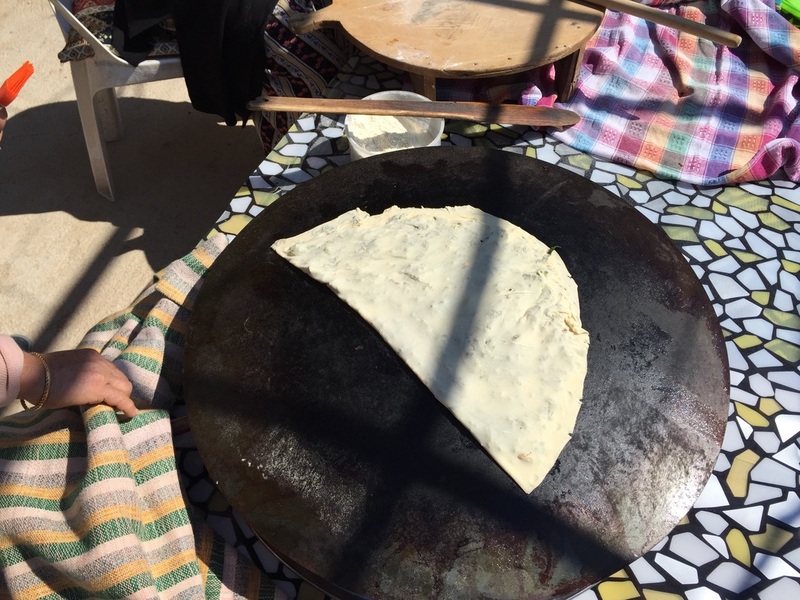 She oiled the other side and flipped it a couple of times and then we had crispy flat treat - kind of like a thin quesadilla. While the women were working, 2 small girls were playing, and then the older - no more than 5 or 6 - was put in charge of the baby (who looked to be no more than a month or 2 old). She hefted the baby up, (wobbly head and all) walked it around until it fell asleep and then put it down on a blanket. 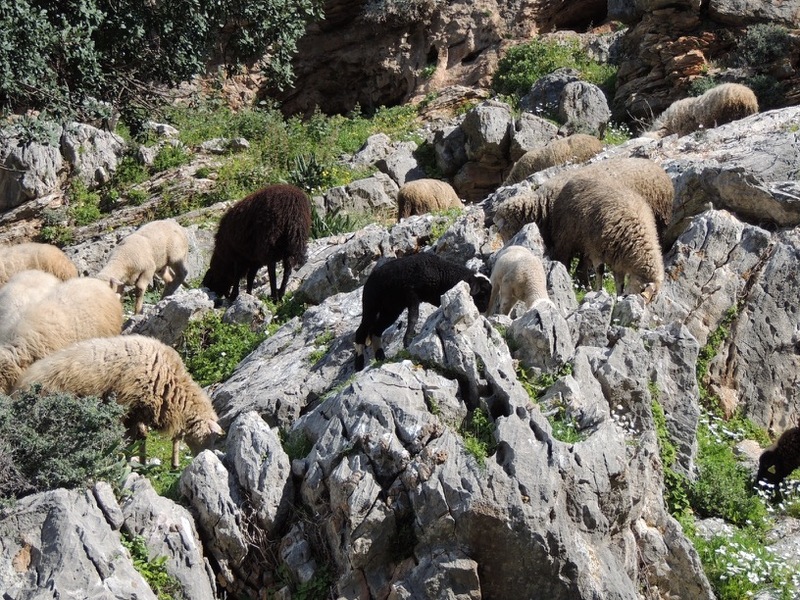 She obviously had had some practice, but it sure looked like she might drop the baby at any time! 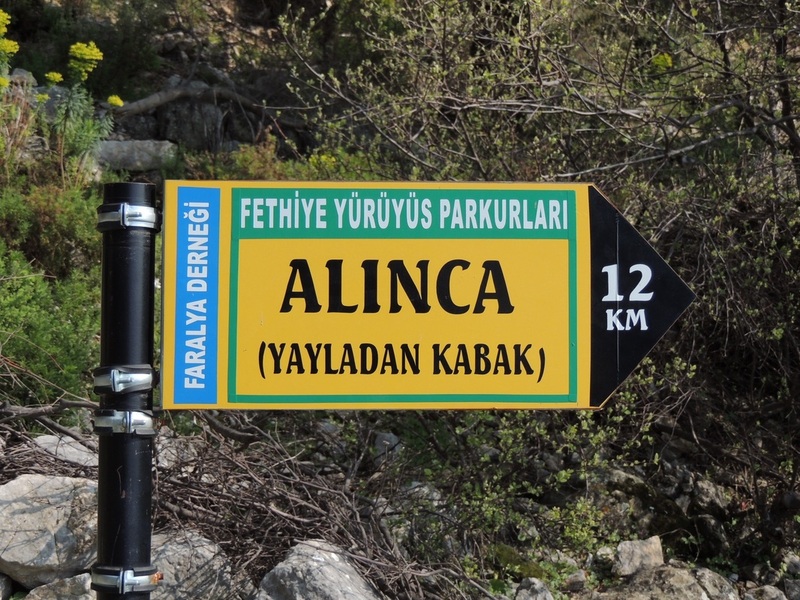 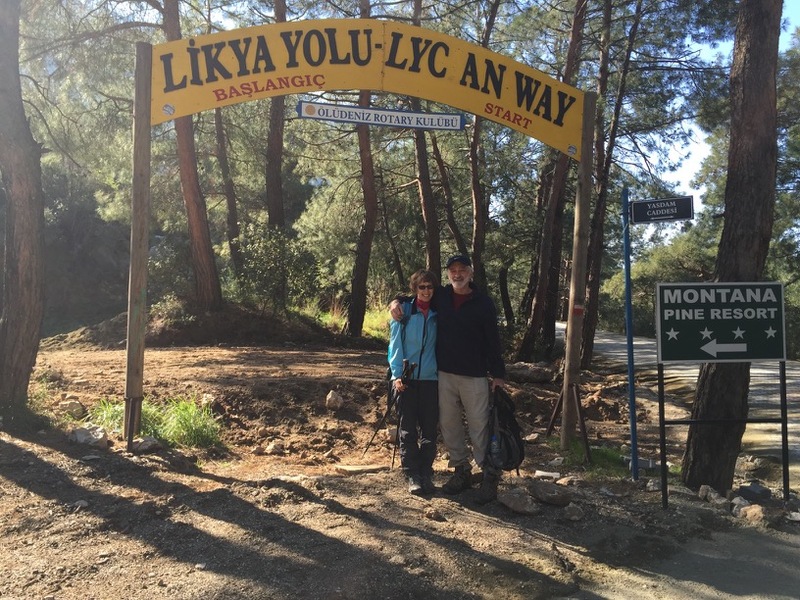 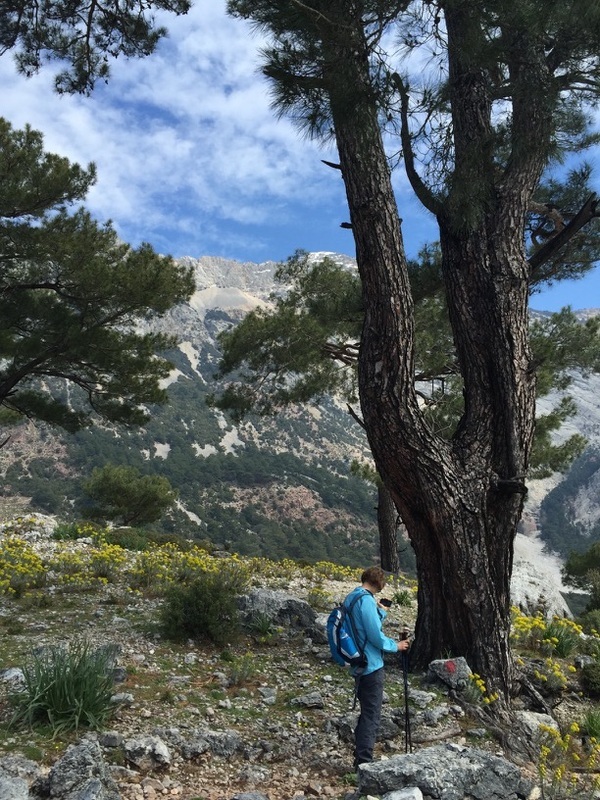 The start of the Lycian Way trail. Walking up - loving those hiking sticks. 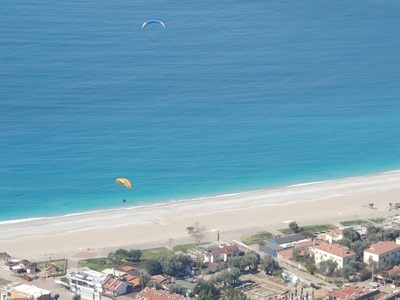 Paragliders landing on the beach. Sign along the way (there weren't many of these). 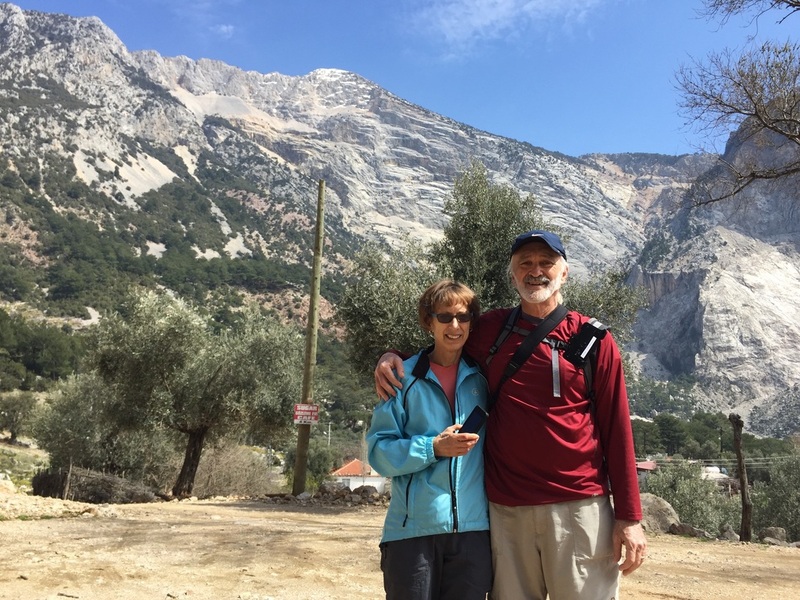 Baba Dagi (Father Mountain) in the back. After filling our water bottles at the cistern. 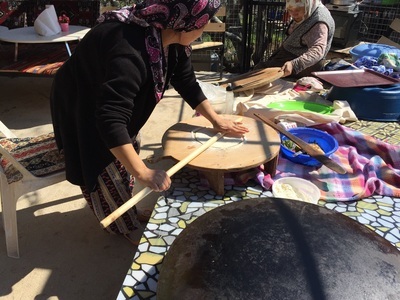 Oiling and cooking the Gözleme. 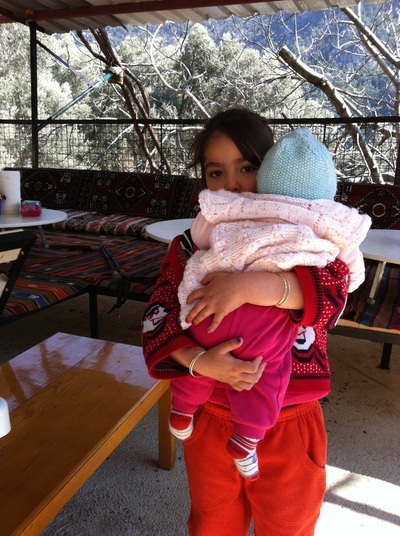 Big sister babysitting - walking the baby until it falls asleep.